Military - Save $5 on Adult ticket with Military ID at main gate. *NLRA Tour Season Finale. All Classes - Full Race Program. *Comp Tickets will be excepted for Thursday's race ONLY! *Late Model heats and "Go Hard or Go Home Pole Dash". All other classes - Full Race Program, 410 Outlaw Sprints BWW Blazin' Challenge Race. **Late Model B-Mains and 92-Lap Feature. All other classes - Full Race Program. 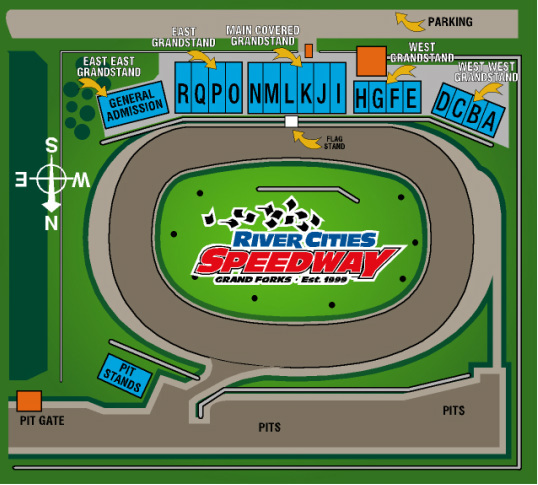 "The Most Action Packed Race Track on the Planet"
Only ND & MN Track Featuring Outlaw Sprints & Late Models Weekly! "My favorite race track. I've been to over 300 tracks in the US, Australia, Canada, and New Zealand & River Cities is officially my favorite!" ~ 2011 Johnny Gibson World of Outlaw Sprint Car announcer.